Creating and developing a business is hard work. You have to start from nothing and build an idea into a functioning business. Once this is accomplished, you begin to focus on growing your business even further. But, scaling a business can prove to be more difficult than starting a business. This is especially true when you are considering moving your business towards the billion-dollar threshold. Accomplishing the goal of having a million-dollar business is an incredible feat. Now think about what it takes to build a billion-dollar company. You will have to focus on four key initiatives. You will have to increase your marketing reach, exponentially multiply your sales, eliminate your competition, and solidify your brand’s recognition. This type of growth takes patience and a strong strategy that is focused on developing each of the key four initiatives. If you want for your business to flourish and grow into a billion-dollar company, follow the advice that is being given. Individuals and businesses have all sorts of problems that are being overlooked. These problems are being overlooked because people starting businesses are building their business to serve their own self-interest, instead of focusing on solving a specific problem. When the focus is on solving a specific problem, you are able to place all of your attention and efforts on a single-minded objective. This helps you since you are not all over the place trying to be everything to everybody. No business can be built to succeed when it is serving too many markets. Its resources and efforts are spread too thin, which produces minimal if any results. Billion dollar companies are focused on being the best at doing one particular thing.They single in on a problem that their target market is having and work to dissect that problem to understand why it exist. This enables them to create a solution to these problems because they have a complete understanding of the problem. Knowing how to provide a complete solutions leads to big profits being made.People pay to eradicate the problems that are causing stress in their lives. The way you learn how to provide a solution to a problem is by understanding your target market. Ask your target market questions. Work to learn about what they are dealing with. Ask them what are the ideal products or services that would make their life easier. When you ask questions, you gain understanding. This understanding can help your business develop the products and services that have demand that is hard to keep up with. Billion-dollar companies create the products and services that stay in demand because they know exactly what their customers want. You need to develop several streams of income from the initial service that you offer. For example, if you are a content writer, you could write your own books, ghostwrite other books, write web content, write sales copy, teach writing classes, and much more. You take your initial skill set and create several money-generating products and services around that skill set to enhance the depth of its impact. Now you are not worried about how you will make money because you have several different ways to make money. Therefore, you never have to worry about going through a dry spell of no money is being generated. Communicate to your customers that you can provide them with better solutions by offering them products and services that dive deep into their problems. When you are able to tackle their problems on all ends, you are ensuring that they are being provided with all possibilities to succeed. People also love options. When they are aware of the fact that you know how to address their problems with many different solutions, they feel like you are an expert in your particular field of service. Billion-dollar companies are known as highly sought after experts that have authority status because they offer multiple solutions that all provide immense value. If you are trying to do every single marketing activity that exist you will be spending a lot of money but produce minimal results for the money you spend. Businesses that have no understanding of who their customers are tend to partake in a lot of marketing activities. This is because they do not know which methods are the best to communicate with their customers. Therefore, they remain in the experimenting phase, instead of knowing the exact marketing methods that work. You learn what marketing methods work by experimenting in the beginning and quickly identifying what will produce the best results. This eliminates money being wasted, by instead being invested into helping you acquire more leads which is the opportunity to generate more customers. That is the purpose behind billion-dollar companies marketing activities, to create more sales opportunities. Sales can only be produced when your marketing is effective in attracting people to learn more about your products or services. Successful companies are constantly investing in the marketing channels that work for them. They never cease investing in marketing just because they have experienced some success. Marketing is the activity that keeps your business relevant in the marketplace. Therefore, you will need to ensure that your marketing is working for you if you want to develop your small business into a billion-dollar company. You do not become a billion-dollar company overnight. It takes patience and a well thought-out strategy that focuses on growth with each accomplished initiative and goal. When you find success by doing some particular strategy, you multiply these efforts to produce the same results, only with a bigger return. This allows you to nearly perfect your process so that you can guarantee your customers they will receive a particular outcome. You will notice that billion-dollar companies make guarantees in order to establish their efficiency. You establish your ability to produce results by building up your success rate. Work to understand all the different problems and challenges your customers will present to you. When you are battle tested, you know how to work past any situation to produce successful results. Learning the ins and outs of your business provides you with multiple game plans that can be implemented based on the situation at hand. Therefore, you are able to proceed forward no matter the problem – gaining recognition for your superior service as a result. You cannot become a dominant company in your industry if your target market does not know who you are. People who looking for a particular product or service need to know that your business is the go to destination to handle their needs. You do this by not only marketing but also using the reach of media. You need to develop relationships with writers of magazines, radio personalities, bloggers, tv personalities, and anyone else who has ties to a media outlet. These people will help your business gain significant exposure — helping it reach new people who never knew existed. You will also need to focus on creating your own valuable content. This will be content shared through your blog, YouTube channel, and articles you write for other publications. Content is what helps you sell your expertise to your target audience. If your content is great and getting a lot of shares, it will be picked up by different media outlets without you having to make the submission. Have you ever seen a billion-dollar company that does not get media coverage, or does not have great content? Small businesses remain small because they tend to think small, only focusing on operating day-to-day. 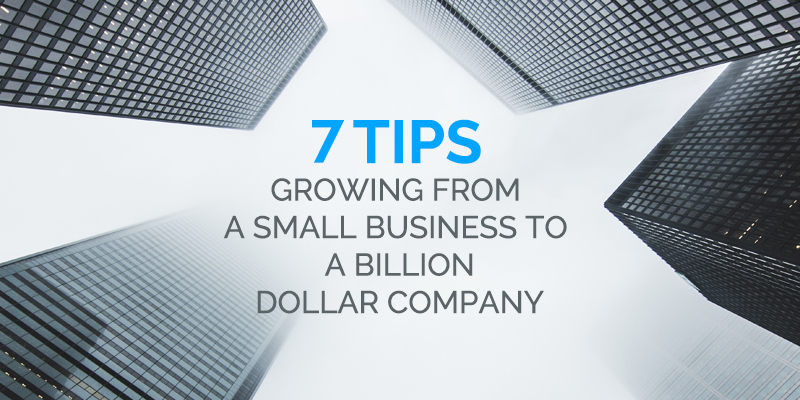 You develop your small business into a billion-dollar company by focusing on future growth. Establish goals that need to be accomplished to promote growth and develop the strategy that will enable growth to occur. You will learn what will be needed in the future my constantly monitoring your industry, and constantly communicating with your customers about their expectations and needs. Billion- dollar company focus on providing high-quality products and services that cannot be duplicated anywhere else. When your customers feel like they are getting superior products and services, price is not an issue with them — they are more concerned with the high-quality experience they are receiving. Billion-dollar brands such as Ferrari and Nike can charge higher prices than their competitors because their level of quality they provide is on a far different level than average brands. Make the improvement of your products or services a constant pursuit. These are the seven criteria to focus on in order to build a billion-dollar company. Basically, the steps involve focusing on your customers, increasing your business’s exposure, and creating products or services of superior quality. It will be a lot of work, but you can definitely turn your small business into a billion-dollar company if you following a well-designed strategy. Focus on taking your company to greater heights. Leave the rest to us.